We were delighted to receive our invitation to the launch of The International Exhibition of Sherlock Holmes in Jersey City next month. We are proud to see yet another location getting ready to host this wonderful exhibition. Working with The Conan Doyle Estate, The International Exhibition of Sherlock Holmes has been able to bring Sherlock to life. With the help of our experts the exhibition allows the visitor to step into Conan Doyle’s Victorian London and work side-by-side with his legendary detective. The International Exhibition of Sherlock Holmes is just one example of the global reach and world class expertise that The Conan Doyle Estate can provide. Our international network of specialists have been closely involved in consultancy and detailing for the making of the exhibition and it was with pride that it was opened in 2013 at the Oregon Museum of Science & Industry by Richard Doyle, senior director of The Conan Doyle Estate and Sir Arthur’s grandnephew. The exhibition was hosted at the Powerhouse Museum in Sydney Australia in 2017 and the end of April 2018 has seen the acclaimed Exhibition putting down roots in Houston, USA, next stop is the Liberty Science Center in Jersey City from the 3rd of November 2018 till the 26th May 2019. 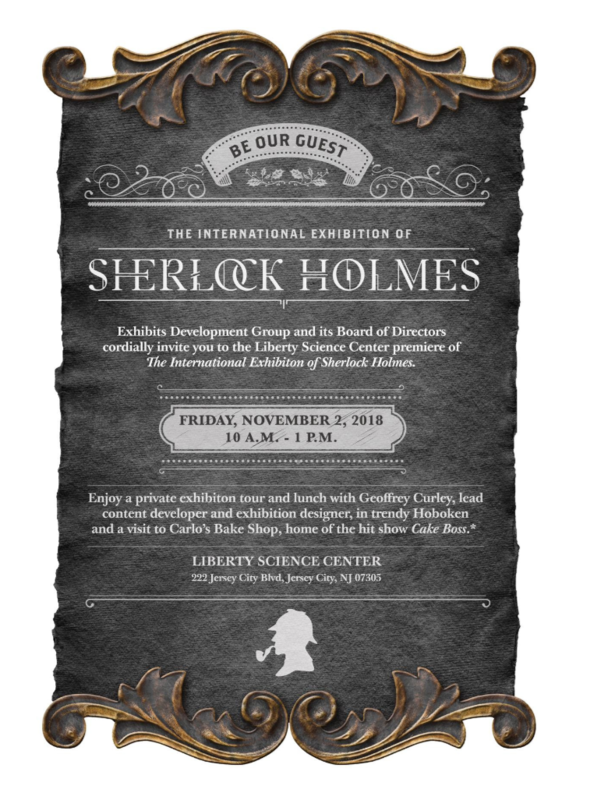 The International Exhibition of Sherlock Holmes was developed by Exhibits Development Group and Geoffrey M. Curley + Associates in collaboration with the Conan Doyle Estate Limited, the Oregon Museum of Science and Industry, and the Museum of London. Take a look HERE for full details about The Conan Doyle Estate's license with The International Exhibition of Sherlock Holmes and hear Richard Doyle in conversation about his Great Uncle Arthur.